Sun rooms are very difficult to work with, mostly because they can be too hot in summer and far too cold in winter. If you’re hoping to create a calm and serene space in your home, your sun room is the best possible place option for this. It is bright and airy and will make you feel close to the seasons year round. Sun rooms make perfect home gyms, meditation rooms, libraries and tech-free living spaces. You can often create a calming space with just a few tweaks to the existing decor. 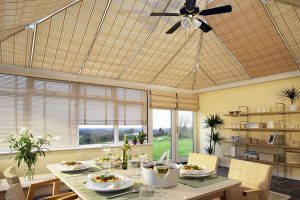 Modern conservatory blinds have advanced a great deal in the past few years and can now offer excellent insulating properties. Updating your blinds will help you to keep your sun room cool in summer and cozy in winter, which means you won’t be left avoiding your sun room during any month of the year. 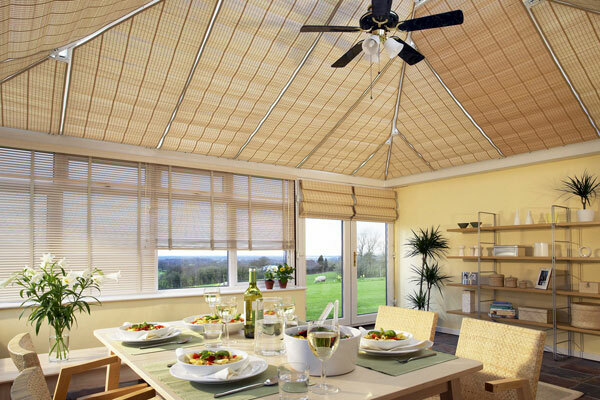 For a natural feel, choose bamboo or birch roll up blinds to create a calming atmosphere. This is particularly important if you plan to use your sun room as a guest bedroom. Creating a calm and minimalist interior is easily achieved by switching out your sun room furniture. For a breathe of fresh air that will make you feel like you’re right by the ocean, choose high quality cane furniture in a light shade with beach-inspired cushions. Furniture with legs is more attractive in these types of spaces as it provides visual balance to the room and prevents any areas from becoming too dark. You can further balance the room and create a clean and fresh environment by bringing some of the greenery from outdoors inside. Your sun room may look out onto a lush lawn, but bringing a few small potted plants indoors will help to create a serene atmosphere with pops of green. Hanging plants against the windows is also an attractive choice for sun rooms. What you find relaxing is a very personal choice, so while some people might like to be surrounded by books others will find it more relaxing to be surrounded by lush greenery. Once you’ve established how you want to use your sun room, there’s nothing to stop you from using the room however you wish. While some might fill the room with warm and cozy blankets, candles and photos of loved ones, you might find it more relaxing to clear out the clutter and simply place a yoga mat on the floor – the choice is yours!